More plants die from too much water than any other cause. While it may seem counter intuitive to let plants dry out, it actually benefits plants by allowing oxygen to pass into the soil. So let your plants take in a breath of fresh air once in a while. Use your finger to test whether the soil is dry 2 to 3 inches below the surface-that's when you should water. Also, when in doubt, check your plant's roots by gently lifting it out with the tip of a spade. Look for black or mushy tips, which indicate rot. All plants need light to survive. You probably knew that already but did you know that the most common cause of lack of blooms is insufficient light? In general, low-light plants such as impatients don't need direct sun. Part-sun or medium-light plants such as violas do best with three to four hours of direct morning sun and some dappled afternoon sun - light that's filtered through a nearby tree, for example. Zinnias, petunias, and other full-sun plants generally need size hours or more of direct mid-day or afternoon sun per day to do their best. Believe it or not, plants can get sunburned, too. And until someone invents a sunscreen lotion for plants, it's important to avoid putting medium-or-low-light plants in too much scalding afternoon sun. Different seasons can also mean fluctuations in light intensity, so while a plant might have been happy with a few hours of direct sun in early spring, it may be getting too much sun once the dog days of summer roll around. One advantage container plants have over garden plants is that you can move them around as the seasons change. A good rule of thumb for low-light plants is to put them in dappled shade or a place where they will get early morning or late afternoon sun. 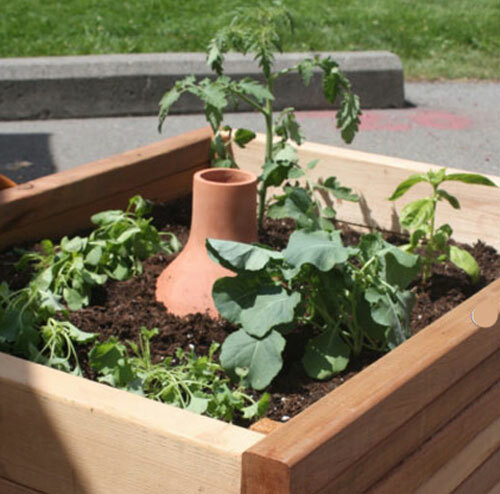 Plants in containers need to be fed more often than plants in the garden. Frequent watering causes nutrients to leach out of the soil over time, leaving impoverished soil. The solution is to feed all of your foliage plants about once a month during periods of growth. Feed blooming plants more often, since they require more energy for flower production-about once every two weeks while in flower. The rest of the time, you can treat them like foliage plants. If you're planning to overwinter your container plants, stop fertilizing completely by September so plants go dormant in time for winter. Prevent pest and disease problems from rearing their ugly little heads by practicing good hygiene. This means disinfecting your tools with rubbing alcohol or a bleach solution after each use, rinsing out old containers with soap and water, and throwing out potting soil if it was previously home to diseased plants. You can nip most insect problems in the bud if you catch them early enough. Start by spraying plants with a strong stream of water and wiping the insects off with a damp paper towel. Disease pathogens thrive in wet conditions, so keep leaves dry and soil slightly dry. 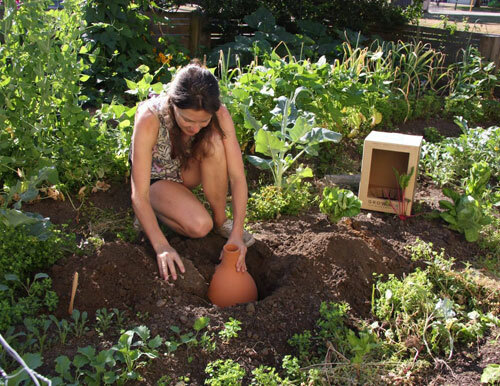 Choosing the right container for your plant is almost as important as putting it in good soil. Since most flowering annuals don't have very deep root systems, they'll do well in containers that are wider than they are deep. If, however, you fall in love with a tall container and want to use it, fill the bottom half with a filler material such as packing peanuts or broken up shards of pottery, then add potting mix on top. This helps provide better drainage and prevent root rot. Use a container that is no more than 2 to 3 inches larger than the roots of the plant, so the plant doesn't drown in excess soil & water. Annuals will die when freezing weather comes, and you can choose new ones next spring. But if you plant perennials in containers and want them to last through winter, check each plant's hardiness zone to make sure it will survive in your region. Plants in containers tend to be more vulnerable to extreme temperatures, so it's wise to buy plants that are hardy to at least one hardiness zone colder than the one you're in. For borderline plants, provide extra mulch or move them into an unheated garage in winter to keep them safe. 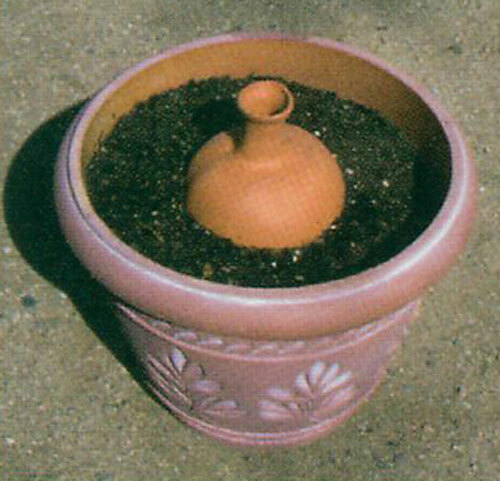 Many years ago Spanish settlers brought to the American Southwest the fruits of their homeland, and with them, the ancient practice of clay pot irrigation. These pots, called "ollas" were soon recognized by the indigenous people of the Southwest for their water conserving qualities and adopted into native gardens. By combining the design of native produce and traditional styles with the age old practice of clay pot irrigation, Agua de Vida is preserving our rich heritage. Over time, modern systems were adopted, but these modern systems are not as efficient as irrigation by seepage by buried ollas. Modern systems, even surface drip irrigation systems loose more water to evaporation and are more likely to clog than this olla system. 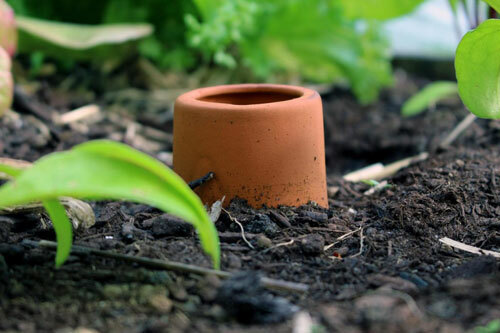 When they are used properly, plant roots will proliferate around the moist clay jar, intercepting water before it can move through the soil by capillary action. This water intercepted by roots will then be used in the plant transpiration stream. The results are 100% of applied irrigation water being absorbed by the plants. Our future is tied to the availability of water. Recognizing this fact, many cities within the United States have recently placed strict regulations on private and commercial water usage in attempts to slow the depletion of our limited water sources. Ollas put water where the plants need ti most-at the roots, virtually eliminating evaporation, ollas are one of the most efficient ways of irrigation. Discovering new ways of saving out water has never been more critical. Conserving our water means conserving our future. Containers application: Bury Olla halfway in center of pot. 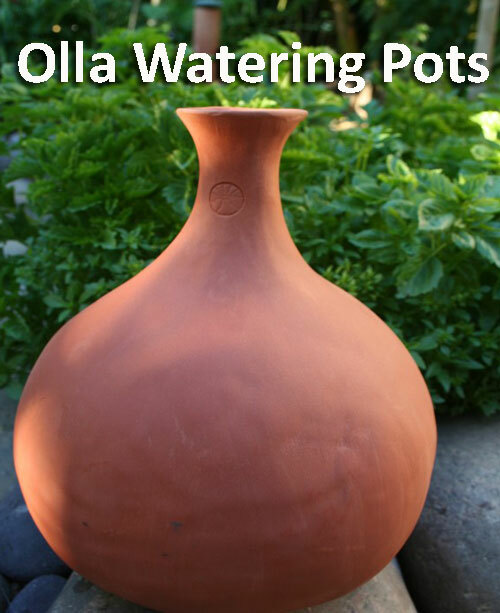 Place plants requiring the most water against the olla, low water plants towards the edges of the container. Additional surface water may be needed to establish new plants. Once plants are established, the olla should be refilled regularly based on the moisture content of the soil, NOT on the amount of water in the olla. To minimize evaporation, cap the olla with a stopper or saucer. Watering times will vary based on olla size, soil type, & application. Ground application: Although ollas can be used in flat ground, it is not recommended. If you choose to do so, follow the same directions for containers. Mound application: One of the most efficient means is within a mound or raised bed. Because the olla irrigates from the inside out, a mound maximizes the planting area and assures that the maximum amount of applied water goes directly to the plant roots. 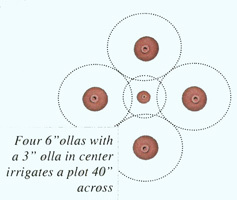 Mounds can be shaped to accommodate multiple ollas. We sell these Ollas, click here to see more. Lois, I don't know anyplace in WA where you can buy the ollas. WE do sell them online and ship all over the US. Cora, Thanks for contacting us. We do not have a retail store but ship the ollas across the US. I am sorry but I don''t have the name of a local person for you to visit. mercedes - i am sorry it has taken me so long to get back to you. i wasn't notified that your comment was made. anyway, unfortunately we only carry the two styles even thought they come in different types. the bottle and the pumpkin are all that we carry in the different sizes. can you please post pictures of each "olla" type/model/size, as well as their approximate dimensions? this information is not displayed on the purchasing page, and the unlabelled pictures posted there show these pieces as having quite a number of shapes and sizes. some of them, for example, have longer and wider necks, others shorter and narrower. another piece looks like an elongated squash, not like a bottle or pumpkin. it would be nice to know what each type/model/size looks like and its dimensions before ordering. pictures will not enlarge. how many holes are in the ollas for the water to get out or does the water just seep out through the clay? i actually found this more entertaining.